Today, we begin the second part of our story with our first discussion in Unit II - Responding to International and Domestic Crises. In this unit, we will continue our story line - how the power of the federal government grows as the United States responds to a series of crises both inside and outside our boundaries - two world wars, the crash of the stock market, and the Great Depression. In the first unit, our story traced the rise of federal power - sometimes at the expense of state power - as the nation grew in size and in industrial strength. And we also saw the rise of federal power as our imperialistic impulses created a colonial empire in both the Caribbean and the Pacific. In the next two days, we will again witness the rise of federal power in the foreign policy arena as we see how President Woodrow Wilson leads a reluctant nation into the first tumultuous world war. As we begin this discussion, I want to emphasize that this war began - as many do - with optimism by all sides. Indeed, across Europe and throughout the U.S., the war was portrayed as romantic and glamorous - as well as good for the U.S. economically. And it was "sold' to the American people as a new way of discussing foreign policy - using it to achieve freedom for people living without it. Where have we heard these types of statements before? So, think about these ideas - the romance and glamour of war, why it might be good for the U.S. economically, and how the war might involve us in a new discussion of freedom - as our discussion proceeds. To understand the geopolitical realities of Europe in the 19th Century and how five organic weaknesses in Europe led to the first large-scale global war - World War I. To gain a chronological understanding of the progression of WWI. To study the reasons for American entrance into the war to "make the world safe for democracy." By the end of the 19th Century and the beginning of the 20th Century, Europe was plagued by what the late Dr. Joachim Remak called "five organic weaknesses" - weaknesses that led to the outbreak of World War I - as well as a final "precipating event." As we have already learned, many historians refer to the 19th Century as the golden age of European imperialism - an age during which Europeans owned or controlled most of Africa and Asia and all or part of every other continent. Wealth and power was defined by one’s colonial possessions and each country's prosperity hinged on its ability to maintain and expand its colonial empire. 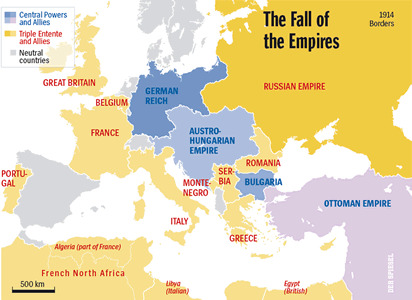 As the map below indicates - European colonization in 1900 - the quest for empire drove the foreign policies of most European nations during the 19th Century. Britain was dominant in India - which becomes the centerpiece of its empire. Africa was 90% under European control with Britain and France owning most of the continent. By 1900, any territorial gain by one power meant the loss of territory by another. 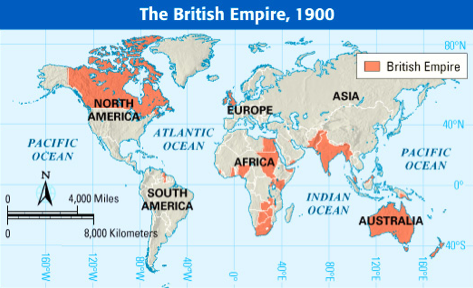 Britain was the strongest of all the empires - British colonial territory was over 100 times the size of its own territory at home, thus giving rise to the phrase "the sun never sets on the British empire." How did this happen? 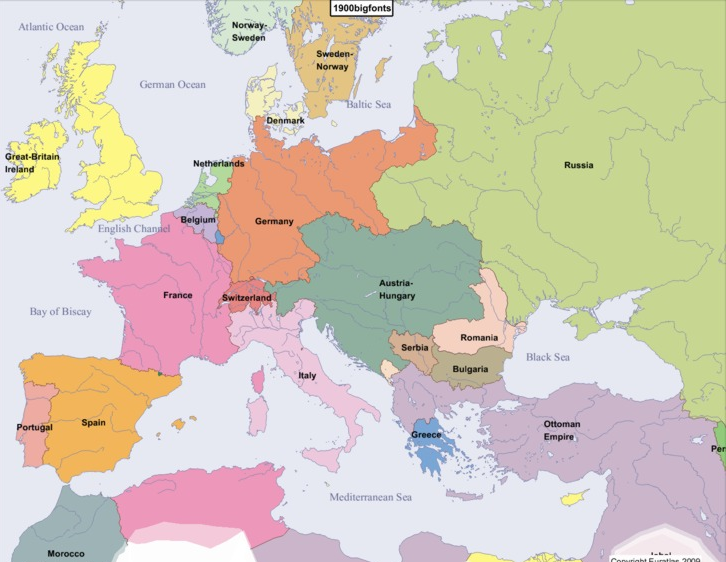 This animated map of the "Political Borders of Europe, 1519-2006" at http://www.youtube.com/watch?v=nq0KNfS_M44&NR=1&feature=fvwp should provide some clues. Conclusions about Organic Weakness #1 - how unprecedented imperialism led to war: The rapidly expanding empires seemed to have no understanding about the bitterness that reckless imperialism brought between competing empires, nor did they seem to understand how imperialism influenced the politics of previously-sovereign nations that came under colonial control. Consequently, unprecedented imperialism highlighted a second organic weakness - historical and contemporary grievances among the European powers. Conclusions about Organic Weakness #2 - how historical and contemporary grievances led to war: These grievances were all about expansion and contraction of empires. As one empire expanded, another contracted - leaving those nations, ethnic groups, regions with bitter attitudes about colonization as well as hopes for regaining political sovereignty. Consequently, these historical and contemporary grievances became clearly expressed through the third organic weakness - the series of shifting and entangling alliances that arose toward the end of the 19th Century. The Three Emperors' League of 1873. Germany, Austria-Hungary, and Russia promised to consult on matters of mutual interest and to maintain neutrality in case one should be attacked by another power. Broadened in 1881 - pledged that if any one should "find itself at war" with a fourth power, the others would remain neutral. Died in 1887. The Dual Alliance/Monarchy of 1879. Germany and Austria-Hungary pledged support should Russia attack either country. Triple Alliance of 1882. Germany, Austria-Hungary, and Italy. Italy needed an effective ally against France, so looked to its enemies. Italy left the Alliance in 1911. Reinsurance Treaty of 1887. 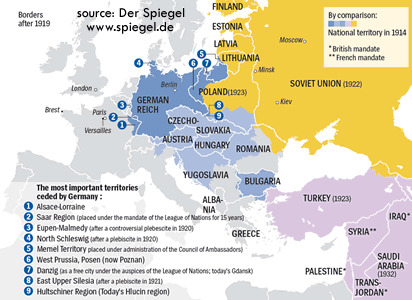 Germany and Russia agreed to maintain benevolent neutrality if either entered war. Cancelled in 1889. 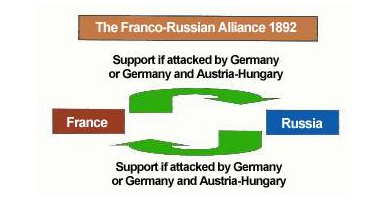 Franco-Russian Alliance of 1892. France and Russia agreed that if any member of the Triple Alliance mobilized, the two nations would mobilize and should war ensue, under certain conditions, they would fight side by side. Entente Cordiale of 1904. Britain and France agreed to settle all outstanding colonial disputes - especially in Morocco and Egypt. Opened way for series of talks between each government's military. Anglo-Russian Accord of 1907. Britain and Russia agreed to settle all outstanding colonial disputes - especially in Persian, Tibet, and Afghanistan. The Accord led to the creation of the Triple Entente - Britain, Russia, and France. And if we look at these alliances, it is clear that Britain avoided them prior to the turn of the 20th Century. Since the British had the strongest navy in the world, it assumed that by continuing to grow its naval power, it could protect its colonial powers against any other European power. But by 1900, the Germans were building a navy to compete with and eventually supercede the British navy. At that time, Britain entered two alliances - one with France and another with Russia. 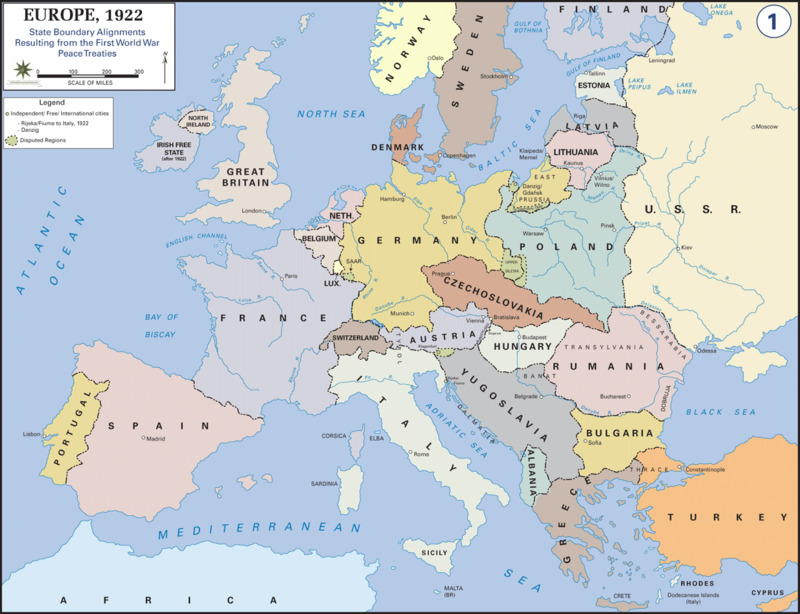 Thus, by 1907, Europe was divided into two hostile camps: the Central Powers of Germany, Austria-Hungary, and Italy, and the Allies, or the Triple Entente, of Britain, France, and Russia. Conclusions about Organic Weakness #3 - how shifting and entangling alliances led to war: The consequence of these alliances was the division of two divided and armed camps that existed in Europe by 1914. Thus, one offense against any Euroean nations might ultimately draw in that nation's ally, and that ally's ally, or allies. The alliances gave smaller powers - like those in the Balkans - an opportunity to begin a crisis that could become a world war. For example, an action by Austria-Hungary against Serbia might involve Russia, which in turn, could call upon its allies France and Great Britain to come to its aid. Consequently, these shifting and entangling alliances became publicized through the fourth organic weakness - an unrestrained press. "Our business is to get an audience. Whatever else it is, our newspaper must be excessively interesting, not to the good, wise men and pure in spirit, but to the great mass of sordid, squalid humanity. Humanity is vulgar, so we must be vulgar. It is coarse, so we must not be refined. It is passionate; therefore the blood that flows through our newspapers must be warm." Conclusions about Organic Weakness #4 - how an unrestrained press led to war: A European and American press more concerned with sellling newspapers than with telling the impartial story of the grievances and shifting alliances brought about by imperialism added to the already fragile environment in Europe in 1914. Consequently, the unrestrained presses of Europe helped to publicize the final organic weakness - unrestrained nationalism. The frictions caused by the first four organic weaknesses contributed to excessive and blind patriotism. This led to unrestrained nationalist impulses in which one nation or empire glorified its existence among all others. This was especially evident in the Balkans where Croatia, Bulgaria, Serbia, and Bosnia had been sovereign nations during their early histories. However, by the end of the 19th Century, each had been integrated into a larger empire and had lost its sovereignty. Croatia had been part of the Austro-Hungarian Empire since 1868. Bulgaria existed autonomously within the Ottoman Empire between 1878-1908 and then gained its independence in 1908. Conclusions about Organic Weakness #5 - how unrestrained nationalism led to war: By 1914, Bulgaria and Serbia were weak new nations while Bosnia-Herzgovina and Croatia had unwillingly become part of the Austro-Hungarian Empire. Retaining national identity became the rallying cry for Bulgaria and Serbia, while regaining their national identity became the goal of Bosnia-Herzgovina and Croatia. But these Five Organic Weaknesses were not enough to bring about war. Something else was needed - a Precipitating Event. This needed to be an event that would move Europe out of a period of intense competition and uneasiness and into one of intense crisis. That event took place in Sarajevo, a major city in Bosnia. 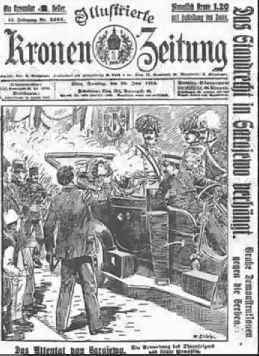 On June 28, 1914 - the anniversary of the 14th Century Battle of Kosovo that ended Serbian independence and placed Serbs under Ottoman rule - the heir apparent to the Austro-Hungarian throne was assassinated. 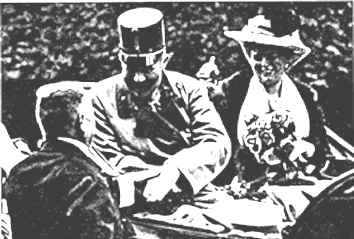 The Archduke and his wife were visiting Sarajevo and were assassinated by a Serbian secret society - the Black Hand - that was committed to the creation of a greater Serbian nation. The Black Hand believed the Archduke wanted to keep Serbia within the Austo-Hungarian Empire and would stand against any movement for Serbian independence. And how did this murder of an unpopular man lead to war? Austria blamed the independent nation of Serbia for the murder. It was well known that Serbia hoped to unite Bosnia and Serbia into a new and larger Serbian state. Austria decided that Serbia must be punished for its involvement in the assassination and planned an invasion. Serbia called on her ally Russia for help. While Serbia would have been easy for Austria to crush, Russian involvement was a different issue. Thus, Austria called on Germany for help. The German government agreed and their response provoked the French government. Therefore, within weeks of the murder at Sarajevo, five out of the six most powerful European nations were on the verge of war. On August 4th, 1914, Germany invaded Belgium - and an intricate chain of alliances forced Europe into action. And what were the goals of these great powers at the beginning of the war? The Germans wanted to expand their colonial empire as well as to achieve greater security by ending their encirclement by their enemies - Russia and France. The Balkan peoples of Croatia, Serbia, and Bulgaria all wanted independence from their Austian rulers. The Russians wanted access to warm water ports through the Balkans and the Ottoman Empire so that it could expand its navy and trading. The Austrians wanted things to cool down in the Balkans so their empire could stabilize. The British wanted to honor its treaty obligations to Belgium (signed in 1839 and guaranteed Belgium's neutrality in wartime) and to prevent Germany from achieving a position of overwhelming strength in Europe. July 23 - Austrians present a humiliating ultimatum to the Serbian government amounting to Austrian intervention in Serbia's internal affairs. 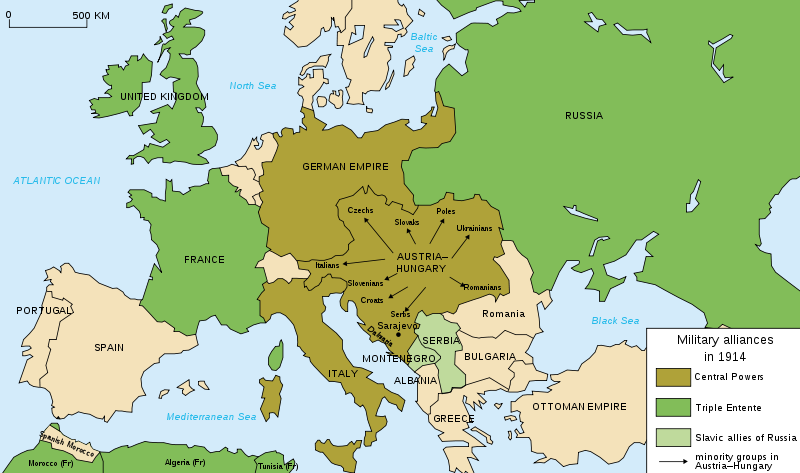 July 28 - Dual Alliance of Austria-Hungary and Germany declare war on Serbia, determined to crush its independence. August 1 - Germany declares war on Russia (even though her ally was still only at war with Serbia). August 3 - Germany declares war on France, citing an alleged French air raid on Nuremberg as justification. Germany, on her own initiative, was now at war with two great powers, Austria-Hungry only with Serbia. August 4 - Britain declares war on Germany after Germany demanded unobstructed passage for her armies through Belgium. (Britain was the guarantor of Belgium's neutrality stance.) Germany now at war with three major powers. August 6 - Austria declares war on Russia; Dual Monarchy now at war with Russia. August 12 - Britain and France declare war on Austria; Montenegro declares war on Germany. August 25 - Austria at war with Japan. Nov. 5 - Great Britain and France declare war on Turkey. 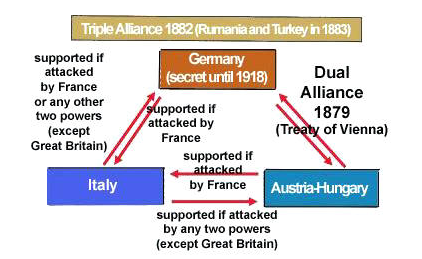 May 23 - Italy abandons the Triple Alliance and joins the Allies after securing promises of Austrian territory from them. 1917 1917 marks a turning point in European history. First, for the first time an outside power stepped in to help Europe settle its affairs. Thereafter, the US would have a large say in the future of Europe. Second, the Russian Revolution marked the ascension of a socialist nation committed to the destruction of the pre-European order. April 6 - US declares war on Germany - the Americans enter World War I.
January - President Wilson went before Congress to explain American war aims through what were called the Fourteen Points. The last point would establish "A general association of nations...affording mutual guarantees of political independence and territorial integrity to great and small states alike." Jan. 12 - Paris Peace Conference convenes. Goal #3: To study the reasons for American entrance into the war to "make the world safe for democracy"
Wilson understood that if we did not enter they war, we would not be able to help shape the peace that he envisioned - making the world "safe for democracy" and creating a new world order that would change the balance of power in Europe. This new world order would replace the traditional great power politics that brought Europe into the war and would instead emphasize the need for collective security, democracy, and self-determination in countries throughout the world. These ideas were embedded in his famous "Fourteen Points." Point 5 suggested the international arbitration of all colonial disputes. Raised issues about US and European commitments to territorial requests for self-determination and autonomy for peoples formerly ruled by the Austro-Hungarian and Ottoman Empires. Suggested the creation of a "general association of nations to ensure peace and resolves conflicts through negotiation" - the League of Nations. Advocated "collective security" - the idea that in case of external aggression of any League member, the Council would determine how member states would respond. Americans had increased their economic ties with the Allies. England, especially, becomes a huge market for American goods and for loans at interest. English and German violations of America's neutral rights on the high seas increased the incidents of submarine warfare and led to the January 1917 announcement that Germany would begin sinking all ships in the waters around England and France. The Zimmerman telegram intercepted from the German foreign minister to the German ambassador in Mexico proposed an alliance with Mexico in case of war with the US and offered financial support and recovery of Mexico's "lost territory" in New Mexico, Texas, and Arizona. 1. Europe was dramatically transformed. Former German and Turkish colonies came under "mandate" control of the victorious nations. France receives occupation rights over Germany's Rhineland - its industrial center. Austria Hungary was carved up to become the newly-independent states of Austria and Hungary. Substantial parts of its territory were added to Rumania and Serbia. The expanded Serbian kingdom later became known as Yugoslavia. A buffer zone of nations was created between Russia and Europe to help deter the spread of Bolshevism - Czechoslavakia, Poland, Lituania, Latvia, Estonia, and Finland. The Ottoman Empire was carved up by the victorius nations. 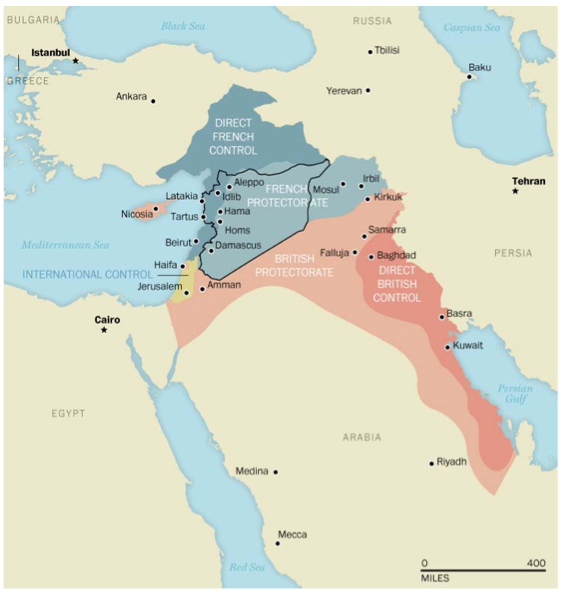 In 1916 - before the war was over - French, British and Russian diplomats signed an agreement to divide up the Ottoman Empire into areas of direct control and "spheres of influence." As the map below indicates, this treaty actually created the modern Middle East borders. 2. The human and economic costs were enormous. Approximately 10 million died due to direct military action. Serbia lost one-quarter of its pre-war population. Typhus killed an unknown number of millions - 1 million in the Balkans alone. Unknown millions were physically and psychologically maimed. People throughout Europe were starving. Economic damage in Europe was unrecorded. In many countries, rail and river transport was destroyed. manufacturing capacity for all of Europe was one-fourth below normal one year after the war's end. The fragile machinery of international exchange was destroyed. Another 50-100 million people died - 1 to 3 percent of the entire world's population in the Great Flu Pandemic (January 1918 - December 1920). The1918 pandemic killed predominantly previously healthy young adults - a fact related to its occurance during WWI. While the war did not cause the flu, close troop quarters and massive troop movements worsened the pandemic and probably increased its transmission. Some believe the soldiers' susceptibility to the flu was caused by their weakened immune systems due to malnourishment, as well as the stresses of combat and chemical attacks. 3. Germany lost valuable territory and was forced to accept the role as the real aggressor in WWI when, in actuality, all the powers had a shared responsibility. The Austrian-Hungarians acted most recklessly, caring little about the possible consequences of a small Balkan War. Russia might have negotiated an early peace had she mobilized only against Austria. But instead, the Russians mobilized against Germany as well. Britain refused to relinquish any of its imperialist claims and to admit that any other nations might have equally legitimate imperialist claims - especially Germany. 4. Old grievances were exacerbated rather than alleviated. Germans bitterly resented the victors - its historical enemies France and Britain, as well as its newest enemy, the US. They were especially resentful of the harsh peace settlement, the war reparations - that eventually totaled over $33 billion - and the fact that they were held responsible for the war itself. The newly created nations, which had always been appended to other powers, were weak and continued to be dependent upon outsiders for security. 5. Although Americans had escaped widespread damage to our homeland during the 19 months of our involvement, the economic, social, and political consequences upon our people were profound. The status of two groups of previously unempowered persons was temporarily improved - black Americans and women. Over 260,000 black Americans were drafted or volunteered and a half million Southern blacks moved to the urbanized North where they found decent-paying jobs. Over 1 million women worked in industry between 1917-1918, but few women actually entered the workplace, moving, instead, to better-paying positions. Gains of both groups were short-lived. However, when peace negotiations began, Wilson insisted that his 14 Points should serve as a basis for the signing of the Armistice. So, what happens with Wilson's vision? #9 - the establishment of an independent Poland. The war's aftermath destroyed the Wilson Presidency. 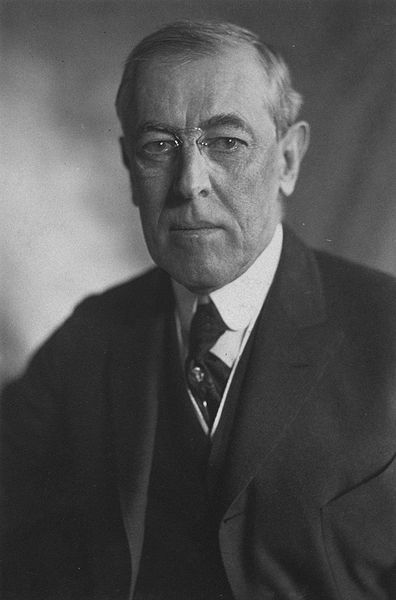 During the elections of November 1918, Wilson had appealed to voters to elect a Democratic Congress saying that any other result would be "a repudiation of my leadership." This alienated many moderate Republicans as well as many of Wilson's fellow democrats. The Democrats lost both the House and the Senate. When he went to Paris to negotiate the peace treaty, he refused to take any prominent Republicans and purposefully ignored the powerful Republican senator from Massachusetts, Henry Cabot Lodge who was head of the Senate Foreign Relations Committee. When he came home, was this Congress that had to "buy" his treaty and the revised 14 points. After a grueling trip across the nation to appeal to the people, Wilson had a stroke and while convalescing, Congress failed to pass the treaty or approve involvement in the League of Nations. A treaty, without the League of Nations and without accepting the 14 points, was not signed until almost three years after the last shot was fired. Thus, it was not until July 1921 that Congress, acting in concert with the new president, Republican Warren G. Harding, passed a joint resolution officially ending the war. Wartime powers allowed the federal government to intervene as never before in the lives of Americans. The war, as Foner tells us, "cast a long shadow over the following decade" - the U.S. retreated from the international community by rejecting involvement in the League of Nations, Progressivism and progressive reform came to and end, and we failed to ratify the Treaty of Versailles. From the 1870s through 1914, both the U.S. and the major European powers embarked upon an unprecedented era of expansionist and imperialist foreign policy. Such policies were predictable given the fact that these nations had filled out their own national boundaries and were capitalizing on new technology - especially transportation and communication - to expand their influence into areas that previously had been difficult if not impossible to penetrate. Expansionism, imperialism, and nationalism were not enough to cause the war in Europe. At least two other factors were needed: a precipitating event and a premeditated desire for war. By 1914, all these factors existed. the bitterness the Russians felt as a result of Versailles led to continual feelings of mistrust and imperialist desires at the expense of the western world. The consequences for Europe were enormous. America's entrance into the war marked the beginning of new era for Europeans - thereafter, the United States would have a large say in the political and economic activities of European nations. WWI was the bloodiest, most intensely fought and greatest in geographical extent to have occurred to that time in modern history. it was the first war to show the full impact of science and modern technology. The consequences for the United States were also enormous. The war and its aftermath damaged the humanitarian, progressive spirit of the early 20th Century. 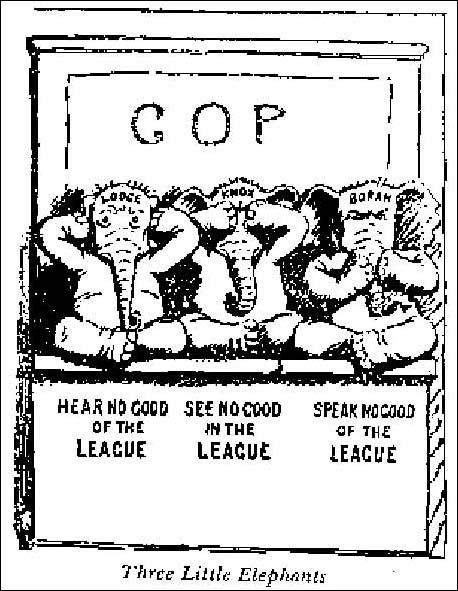 Bruising fights over the war and the League of Nations drained the American people's energy and enthusiasm for reform. Thus, progressivism lost its broad popular support among Americans. The role of the federal government in the lives of ordinary Americans was dramatically strengthened - beginning with the President and Congress's decision to enter into war, to call for a draft, to shape the peace in Europe, and to interfere in the civil liberties of the American people during and after the war. And what have been the long-term consequences of World War I? We visited this topic on the first day of class. Let's see if we can summarize it.